Some states' are moving to create their own fiduciary rules. By the time A.J. Kess joined Travelers’ Insurance Co. as the chief legal officer in December 2016, the year was basically over. Nonetheless, Travelers tallied his total compensation that year as $8.7 million. 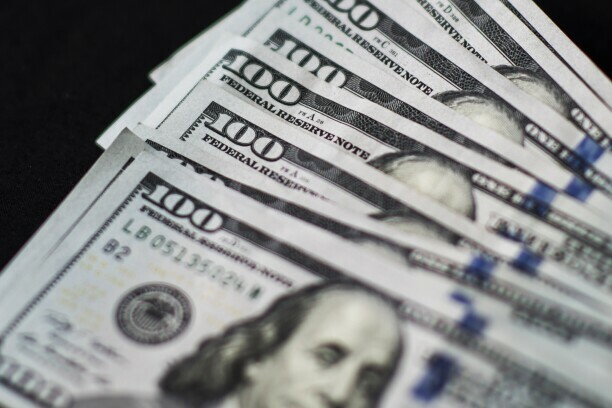 For most of 2016, Kess had been a partner at Simpson Thacher & Bartlett, which posted profits per partner of $3.47 million, according to The American Lawyer. To entice him to walk away from “certain pension benefits,” as the company phrased it in its 2017 proxy report, it paid Kess $4.7 million in other compensation, in addition to a $500,000 bonus, $3 million in stock awards, and $500,000 in option awards. But Travelers listed his salary that year as $3,287—no typo, but rather owing to his brief time at the company in 2016. This year, he’ll receive a more normal-looking $850,000 in salary. As Kess’s situation illustrates, corporate legal departments can and do pay top-dollar figures to lure lawyers away from partnerships that pay millions of dollars. Often enough, the lawyers who choose to accept top positions in-house must forgo high salaries and take other forms of compensation—onetime bonuses, rich stock or option grants, generous pension plans, and other perks such as access to a company car or money for expensive real estate, according to a Big Law Business review of proxy statements. He was far from the top compensated lawyer on our list of richly compensated lawyers: For the second straight year, that honor belongs to Apple Computers’ General Counsel Bruce Sewell, whose compensation was reported at $22.8 million, the bulk of which came from a $20 million stock award. Meanwhile his salary was $1 million. 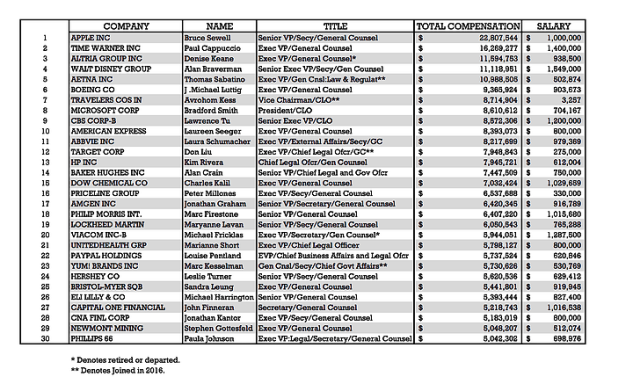 The lawyers listed below declined to comment for this story through their communications departments, but it’s important to note exactly what these compensation figures mean. There may be other lawyers who were more highly compensated than those who appear on the list, but their companies did not disclose that information. For those who do appear on the list, the compensation isn’t all cash, and in fact much of it has not yet been paid. Many companies grant stock and sometimes also option awards on an annual basis, but these awards are often tied to company performance. The lawyers below can only expect to take home the maximum amount of their award if their company meets its specified benchmarks, and sometimes only if the lawyers stick around at the company long enough to earn the awards. But when they do, it often turns into large paydays: For example, we reported Sewell sold approximately $5 million in shares in August 2016, and still at that time reported owning 192,000 shares—enough to make him a millionaire many times over given the company’s trading price. Other lawyers who do not appear on this list similarly cashed in large amounts of stock that they’d accumulated. To clarify, our list is compiled using a simple methodology: Using Bloomberg’s Terminal, we looked at the 500 largest U.S. companies ranked by revenue. The summary compensation tables in their proxy reports show the compensation of their CEO and principal financial officer, and the next three most highly compensated executive officers. If a lawyer appeared on the summary compensation table, we checked to see how their total compensation compared to others. The list below includes the 30 top earners we found. One notable exception is Ronald Bell, Yahoo’s general counsel who reported as receiving $8.7 million in total compensation in 2016, before being terminated in March after revelations about a hack into the company publicly surfaced. Although everyone on the list is a lawyer, not everyone has the same function. Kess, for instance, is the chief legal officer at his company and has broad responsibilities, including a top lawyer who reports up to him, according to a company spokesman. At Microsoft, Brad Smith, as chief legal officer and president, oversees the company’s compliance, and leads a team of 1,300 professionals located in 55 countries. At Abbvie Inc, Laura Schumacher is general counsel, but also oversees health economics outcomes research, and external affairs. It includes lawyers like Kess, who scarcely worked in his new position during 2016, as well as others who have since retired from the company. The list also features chief legal officers, who sometimes have responsibilities that extend beyond the legal suite. A special thanks to Alicia Ritcey of Bloomberg News for help compiling this list.